Like to use the crocheted edged laces? Want to add a personalized bridging lace? Make your own and have some fun in the process. Any fabric will work and try different threads. I used gold lame fabric (so shimmery!) 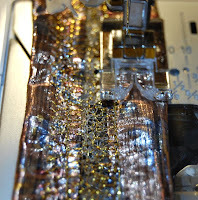 and decided to try Sulky Sliver Metallic - a thin, flat ribbon-like thread. I used a 90/14 needle and lowered my tension just a tad. You will need fabric, thread, and heavy wash-away stabilizer. I did not have the heavy weight on hand, so I fused layers of medium weight. Place several layers of the stabilizer on a scrap cloth, cover with a pressing cloth, and press with a hot iron. This also works for those many tiny scraps you accumulate. Don't throw away, just fuse to a larger piece. 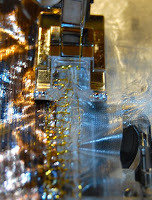 Place the stabilizer just under the fabric edge. 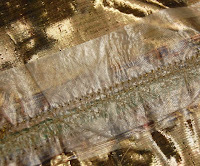 Sew a straight stitch seam very close to the edge of the fabric. Select a bridging stitch pattern, such as the ladder stitch or the blanket stitch. 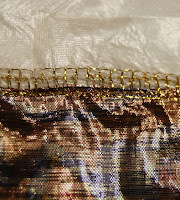 Begin sewing, making sure the left needle swing catches the edge of the fabric. Repeat for additional rows, ensuring the left swing catches the previous stitches. I used the blanket stitch twice, and then switched to the ladder stitch, and back to the blanket stitch. 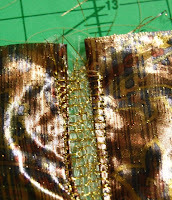 Place the "laced edge" against a second piece of fabric (if you wish to have a lace insert). Choose a decorative bridging stitch and sew, making sure the right swing catches the fabric. Sew a straight stitch down the edge of the second fabric. Rinse the wash-away stabilizer. let dry and use! Back before rinsing stabilizer away. Front of my lace. If I wanted just a laced edge, I wouldn't have sewn the second fabric on. I will use this a the closure on my silk purse. I will try the same process using a heavy cotton thread. What other types of Stitchery are you doing? Planning to sew a cover for my sewing machine. It will be a perfect opportunity to use unfamiliar attatchments and test out some of your wonderful tips. Hi Sandra! That is a great way to play around with the stitches; just having fun making the cover the way you want. You will have to share a pic when you get finished. Have fun with your stitchery!